Bastille Day fireworks light up Paris Jump to media player Fireworks have lit up the Paris skyline as the country marked its annual Bastille Day, the anniversary of the storming of the Bastille prison which helped spark the French Revolution. French full veil ban upheld by court Jump to media player The European Court of Human Rights has upheld a ban in France on wearing the Muslim full-face veil - the niqab. Sarkozy placed under investigation Jump to media player French ex-President Nicolas Sarkozy has been placed under formal investigation over alleged influence peddling. Greek skies light up for Easter Jump to media player Rival parishes on the Greek island of Chios have marked the evening before Orthodox Easter - by firing hundreds of rockets at each other's churches. Fireworks as Sochi Olympics begin Jump to media player The 2104 Winter Olympics have officially opened with a colourful ceremony in the Russian city of Sochi. Firework dilemma for Chinese New Year Jump to media player Concerns about air quality are affecting the sales of fireworks to mark Chinese New Year, says Martin Patience in Beijing. 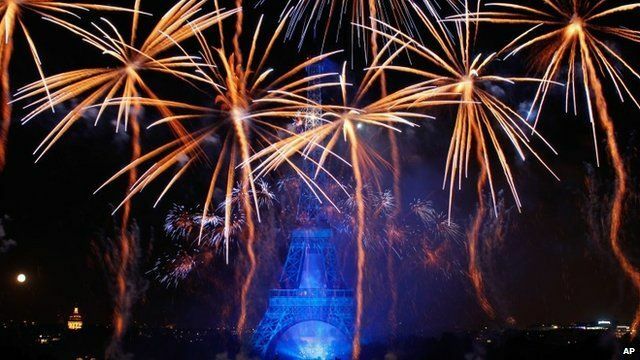 Fireworks have lit up the Paris skyline as the country marked its annual Bastille Day, the anniversary of the storming of the Bastille prison which helped spark the French Revolution. The theme for the 2014 celebration was "War and Peace", to commemorate the centenary of the start of World War One. The 35-minute display included fireworks fired from the Eiffel Tower for the first time in 12 years.